(Bloomberg Businessweek) -- One evening in early February, in the back room of a small Lutheran church in Blacksburg, Va., seven girls joined the Boy Scouts. They stood in front of an American flag, wearing the same khaki shirts and bandanna neckties as the 19 boys there with them. Together they recited the Pledge of Allegiance, followed by the traditional Boy Scout oath. As historic moments go, it was a quiet one. 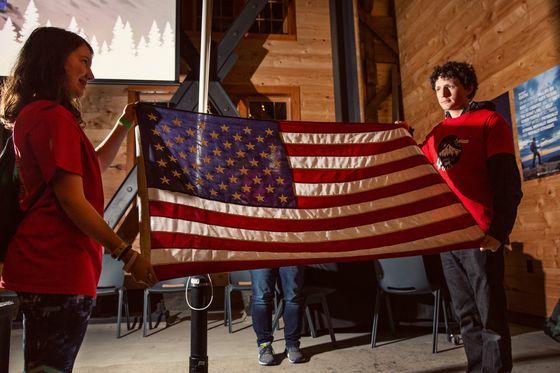 A week earlier, the Boy Scouts of America—the national organization that oversees various outdoors programs for about 2 million children, including Cub Scouts, Boy Scouts, and Venturing—had changed the name of its original, 109-year-old program to Scouts BSA. That made Amalie one of its first girl scouts. Not to be confused, of course, with the Girl Scouts—though Amalie said she’s one of those, too. The process by which a male-only centenarian institution transforms itself into an inclusive, co-ed brand would be complicated under any circumstances, but for the Scouts it’s been doubly so. For decades—in fact, as recently as 2015—the organization had argued, in interviews and in court, that scouting was only for boys. And a lot of people associated with the Boy Scouts still agree with that. “ ‘This is crazy! This is what’s wrong with America! Girls in the Boy Scouts? I mean for crying out loud!’ ” says Michael Surbaugh, the group’s chief scout executive, imitating angry emails and tweets he’s received. Conservative news outlets have run articles with headlines such as “The Boy Scouts Admit Girls, Failure” (Weekly Standard) and “Girls in Boy Scouts Is Bad for Everyone” (Washington Examiner). But strangely, the fieriest reaction has come from the group most famous for supporting young girls: Girl Scouts of the United States of America. 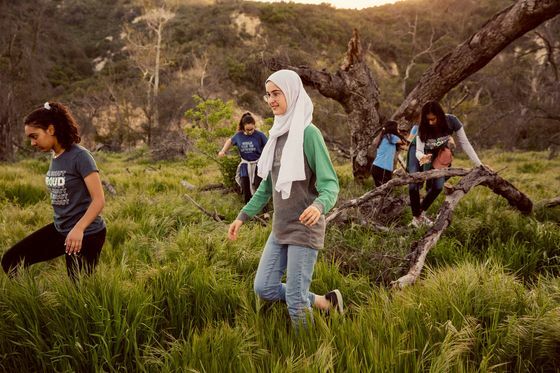 In November, with the change imminent, the Girl Scouts sued the Boy Scouts for trademark infringement, citing online flyers and promotional materials that seemed to conflate the two organizations. In the poorly sourced, factually indifferent areas of the internet, articles have implied that the two groups were merging. (They’re not.) Girl Scout troop leaders and volunteers say they’ve fielded questions from confused parents asking why, given the Boy Scouts’ decision, the Girl Scouts still exists. Two of America’s most benign charitable organizations fighting over the right to call young girls “scouts” feels a bit like the Humane Society and ASPCA arguing about who can best care for kittens. But buried within the Girl Scouts’ lawsuit is a much more fundamental argument about the best way to advance women’s equality. 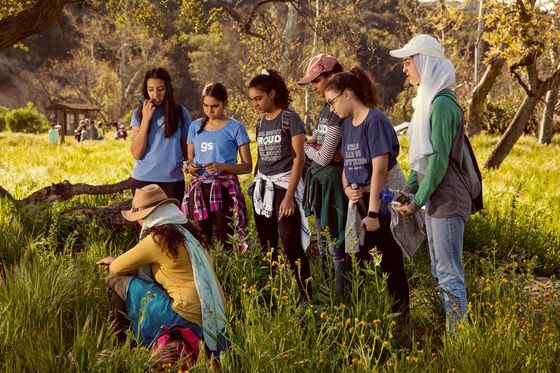 “GSUSA’s services,” the complaint reads, “are founded on research showing that girls learn best in an environment led by girls, through programs tailored specifically for girls.” In other words, the best way to help girls—and by extension, women—thrive is to create something specifically for them. Given the abundance of extracurricular clubs and intramural sports that fill kids’ afternoons these days, it’s easy to overlook just how deeply scouting was once ingrained in American childhood. 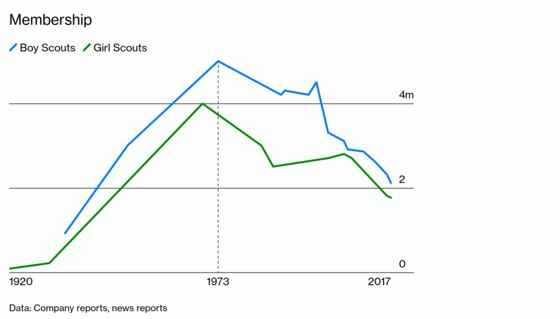 At the peak of its popularity, in the 1970s, the Girl Scouts USA and Boy Scouts of America collectively served about 15 percent of U.S. children. Today, each is less than half the size it once was—a dismal trend that no amount of marketing has been able to reverse. Their stories begin in 1908, when Robert Baden-Powell, a British lieutenant-general, published Scouting for Boys, a children’s version of a training manual he’d written for his troops during the Boer War. His goal was to fix what he saw as a weak, emasculated generation of city slickers unfit for military duty. 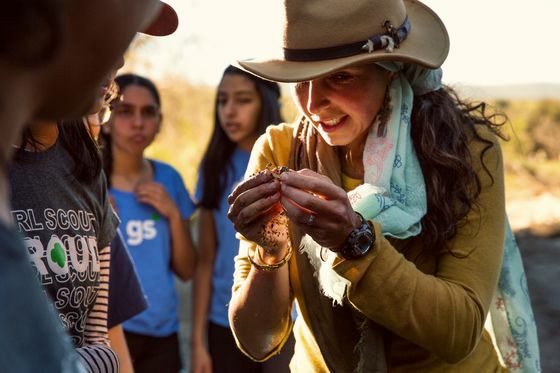 Within two years his scouting program had attracted thousands of members across a handful of countries, including the U.S.
Over time, Girl Scouts’ focus on skills and careers overtook its outdoor programs. The organization emphasizes that it still offers badges in archery and camping, but the overwhelming focus is on professional skills and things that look good on a college application. The Boy Scouts, meanwhile, has stayed truer to its wilderness origins. Both organizations still use Baden-Powell’s original scouting motto: Be Prepared. It’s just that today they’re preparing for different things. Boy Scout troops are always sponsored by an organization, oftentimes a church, while those of Girl Scouts exist on their own. Troops are led by an unpaid volunteer, usually the parent of a scout. This setup worked fine through the 1960s, but as more and more mothers started working full time, both groups struggled to find anyone free to spend their Tuesday afternoons teaching kids how to light a fire. Surbaugh says that for a long time the BSA didn’t understand why it was shrinking. “We thought, We probably just need to increase our marketing, or maybe it’s our programs. Maybe we need to add some new merit badges.” Boy Scouts introduced activities such as traffic safety, with limited success. (Do you know any 12-year-old who wants to demonstrate how to use a seat belt?) “Then we got into the 1990s, and we started getting embroiled in some social controversy,” he says. The Boy Scouts spent much of that decade on the receiving end of discrimination lawsuits. There were several from gay men who’d been rejected or kicked out; two from atheists who refused to pledge their “duty to God”; and one from an 11-year-old California girl who wanted to join her twin brother’s troop. The BSA won every case on the premise that a private organization is able to set its own membership requirements, even if what it does appears discriminatory. That may have been a sound legal argument, but it didn’t earn the Boy Scouts much corporate goodwill. When BSA reaffirmed its stance against homosexuality in 2012, several large donors, including Intel, Merck, and UPS, withdrew their support. The loss of corporate money was a big problem. BSA was bleeding millions of dollars fighting other lawsuits, filed by former Boy Scouts who say they were sexually abused as children by scoutmasters or other volunteers. During one case in Seattle, BSA confirmed it had kept a list of thousands of abuse claims stretching to the 1920s. The 2012 publication of part of that list prompted two of its longtime liability insurers to refuse to cover abuse claims. If BSA kept a list, they argued, it clearly knew what was happening. The Boy Scouts maintains that the list was an attempt to protect children in an era when sexual abuse cases were rarely prosecuted and says it agrees victims are due fair compensation. But money is tight, and Surbaugh says it’s considering bankruptcy as a way to curtail debts. Every day after school in January, a 17-year-old girl named Rebecca set up a folding table outside a store or restaurant in Austin—her favorite spot was on the campus of the University of Texas—and spent the evening selling Girl Scout cookies. The night I met up with her, her location of choice was a suburban Lowe’s. Rebecca had a whole strategy for displaying her cookies. She placed the most popular types, Thin Mints and Caramel deLites (in other parts of the country they’re called Samoas), at the far end of the table, and gave newer, lesser-known flavors like S’mores and Lemonades prominent spots in the middle. Even though it was already dark at 5:30 p.m. and the Lowe’s was at the far end of a sprawling strip mall, obscured from the road, a steady stream of customers managed to find Rebecca, thanks to the Girl Scouts’ location-based cookie app. People bought an average of four boxes each. “It’s so much easier than it used to be,” she says of selling cookies. She’s been in Girl Scouts for 12 years and remembers going door to door armed with order forms. With the app, Rebecca thinks she’ll quadruple her sales this year, to 4,000 boxes. She takes credit cards. Cookie sales are one of the Girl Scouts’ oldest programs. A troop hit on the idea in 1917 as a way to fund activities in an era when wealthy philanthropists weren’t particularly interested in backing programs for girls. At first they baked the cookies themselves, but by 1936 they’d started using wholesalers. Prices, set by local councils, usually hover around $5 per box, the majority of which goes directly to regional councils and local troops. Girl Scouts won’t say how much money troops pull in from cookies—the figure most widely circulated, $700 million, is nearly 20 years old. Regional councils won’t share numbers either, but they do sometimes mention cookie sales in their publicly available annual meeting minutes. Last year, Girl Scouts sold 4.6 million boxes in the Washington metro area. The Girl Scouts of Western Pennsylvania, which oversees 20,000 girls, sold 120,000 more boxes of cookies in 2018 than it did the year before. Kids manage to peddle enough boxes every year to make the Girl Scouts America’s second-largest cookie seller, after Oreo, the organization says. All this cookie money has enabled the Girl Scouts to get more creative—and expensive—with programming. It funds robotics teams. It hosts coding camps and career days. It runs a program called Girl Scouts Beyond Bars, which takes girls to visit their incarcerated parents. It’s built a $14 million, 92-acre facility in Dallas for girls to learn about STEM and is planning another one for Oklahoma. At the same time, adult participation has dwindled so much that in 2014, Girl Scouts had to put 30,000 kids on a waitlist. The organization has tried to stave off decline by recruiting girls in low-income and minority communities. “I didn’t even know what Girl Scouts was until they came to my building,” says Ebony Daniel, who lives in a New York homeless shelter with her three daughters, all of whom are in the program. “In the inner city Girl Scouts was not a popular thing.” Today a third of scouts live in low-income neighborhoods. Girl Scouts USA has largely sidestepped the social controversies plaguing the Boy Scouts. The organization has accepted openly gay kids and leaders for so long, it’s hard to pinpoint when it started. In 2011 a transgender girl in Colorado asked to join a troop and, after some initial hemming and hawing, the Girl Scouts agreed. These moves have rankled a few religious groups and the occasional politician—in 2012 an Indiana state lawmaker opposed an otherwise unanimous resolution honoring the Girl Scouts, calling it a “radicalized organization” that promotes “feminists, lesbians, or communists”—but they sit just fine with companies such as Dell Inc., which has donated thousands of tablets to girls who can’t afford them. When Surbaugh took over the Boy Scouts in 2015, he found the organization in deep distress. The way he saw it, BSA had two choices. “Either become a very small, boutique organization serving what’s probably a legacy clientele—a largely white, largely suburban population,” he says. “Or do we transform into something else?” Given where the organization started—with Baden-Powell’s fears about girly men—change wasn’t going to be easy. “To get that ship turning slowly in any direction, it takes a lot of time,” Surbaugh says. The organization had already lifted the ban on openly gay scouts, but in 2015 it extended it to gay adult leaders. Two years ago, the Boy Scouts admitted transgender kids. These changes didn’t go over well with the Mormon church, which adopted Boy Scouts as its official youth program in 1913. The church considers homosexuality a sin and announced it will sever formal ties with BSA at the end of this year, potentially taking 420,000 boys with it. There still isn’t a formal policy on avowed atheists. In 2017 the Boy Scouts turned to the question of girls. It had always run Cub and Boy Scouts as single-gender programs, but it was aware that local troops sometimes relaxed the rules. A scoutmaster might allow his daughter to tag along with a troop, or a sister might help her brother work toward Eagle Scout. Plus, admitting girls might help stave off the membership decline. In Britain, Baden-Powell’s original organization, now called the Scout Association, has grown every year since it went fully co-ed in 2007. By 2016, more than 70 percent of its new members were girls. But BSA wasn’t sure its program would work for girls. To find out, it commissioned an academic survey of peer-reviewed studies dealing with boys’ and girls’ physical abilities and learning habits to see what, if anything, needed to be changed. “We had a lot of debates on what did we think the percentage of content of Cub Scouts and Boy Scouting would be relevant to young women,” Surbaugh says. He wouldn’t say exactly what BSA fretted girls wouldn’t like—was it the kayaking? CPR lessons? The instructions in the handbook for doing a necktie?—but he admits the concern was wrong. Boy Scouting, like cybersecurity, was perfectly suitable for girls. The next question was what to do about the name. If girls were going to join the program, “Boy” should probably be dropped. That turned them into Scouts. The BSA initials were tacked on to avoid confusion with any other national organization that involved girls and also used the term scouting. Whatever that might be. The Boy Scouts says it decided to keep girls separate after consulting with childhood-development experts and reviewing literature about the best educational practices for kids. But it’s declined to talk publicly about what that research entailed. “I haven’t seen it. Does it exist?” asks Bohn, the Blacksburg scoutmaster. It does, but it concludes overwhelmingly that boys and girls should be taught together. In fact, surveys by both the American Psychological Association and the U.S. Department of Education have found no educational benefit to separating kids by gender. Some studies even suggest that sorting kids based on a visible characteristic like gender or race or even what color T-shirt they’re wearing makes them biased against people who look different. As far as the program itself, BSA’s insistence on gender segregation may be based less on science than on how its 2 million members feel about the issue. BSA executives downplay the infighting, but there are plenty of people who’re against adding girls. “My first reaction was that knee-jerk, old-school ‘Girls don’t need to be in Boy Scouts,’ ” says Joe Mattingly, 50, who lives in Auburn, Ala., and whose son has been in Cub and Boy Scout troops since 2006. Parents in Blacksburg had a strong reaction as well. A week after Bohn held that first troop meeting with girls, he was asked to step down as Troop 158’s scoutmaster. A number of boys’ parents were upset that he’d included girls in their meeting. Some went so far as to switch their sons to a different troop. As Bohn was telling me this, I realized: The only people upset by BSA’s new policy seemed to be adults. I talked to dozens of kids for this article, and every one of them said they liked the idea of girls in Scouts. Girl Scouts didn’t mind, because they already had a club they liked. Boy Scouts just wanted to go rock climbing and camping. Mattingly, in Alabama, noticed this too. When he saw how excited his daughter was to be able to do the same thing as her brother, he realized he’d been wrong. So he formed a girls’ troop and became its scoutmaster. 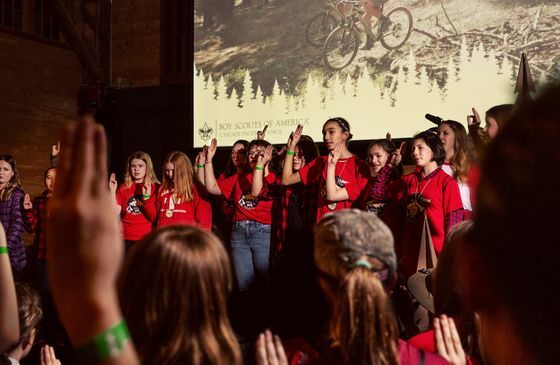 There are only 14,000 girls in Scouts BSA so far, but the number is growing. And no amount of troop-hopping or scoutmaster-switching will make them go away.